AGD is a small business run from home by Andrew Gamble. We offer an efficient, personal service with minimal overheads, ensuring that any costs saved can be passed directly on to clients without compromising on quality. 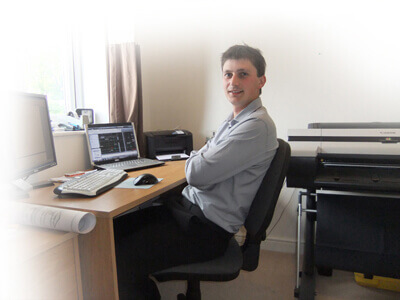 After gaining his degree in Architectural Design, Andrew spent the next 5 years working in design firms gathering more experience in large and small projects as well as dealing with all aspects of planning and building regulations. For the last 6 years Andrew has worked full-time on expanding AGD Architectural to provide a high quality and good value service to an ever larger client base. Most work undertaken by AGD has been obtained by referrals from previous clients. This is testament to the quality service provided, as well as to the initial aspirations of the client being met. Using experience and training within the field of architecture, employing AGD will ensure that the design of projects are fully understood and integrate seamlessly with what can be potentially built on site. To minimise any possible problems with poorly thought through design proposals, architectural plans have to be produced to a very high standard. Knowing exactly how lines drawn on paper relate to physical building materials is one of the aspects of architectural design that AGD prides itself on most of all. Having undertaken personal building projects and by working alongside many builders, AGD understands fully the constructional implications of design and how to convey the important information of construction to you or your builder. If you are thinking of undertaking a project and would prefer to leave AGD Architectural a message, please take 5 minutes to fill out the enquiry form.